Russian navy ships will keep having access to stop off at Cyprus' ports in Mediterranean as the two countries have agreed to prolong the pre-existing deal on military cooperation. The agreement, which applies to Russian vessels involved in counter-terrorism and anti-piracy efforts, was signed by President Vladimir Putin and his Cypriot counterpart, Nicos Anastasiades, in Moscow. The signing came aimed heightened tensions and sanctions between Russia and the EU over the military conflict in Ukraine. President Putin, however, stressed that the agreement, as well as Russia-Cypriot ''friendly ties aren't aimed against anyone." "I don't think it should cause worries anywhere," he said. During his press conference at Tass news agency’s headquarters, Anastasiades stressed that Moscow and Nicosia haven’t signed any new agreements, but only prolonged those that were in place before. 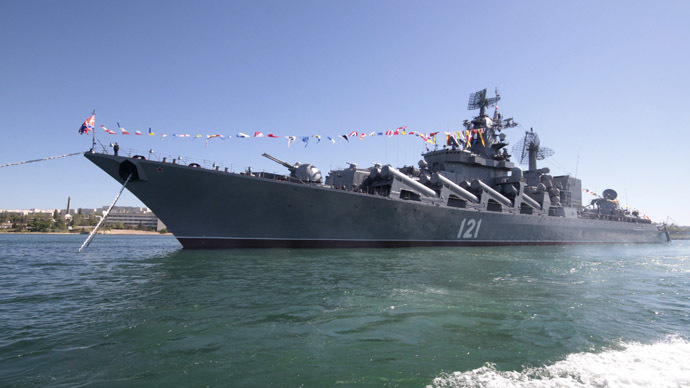 "The updated agreement envisages the right of Russian warships to visit the ports of Cyprus…for humanitarian purposes such as supply and refueling a swell as saving the lives and evacuation of Russian citizens from neighboring states,” he said. He called the prolongation of a military deal with Russia “a sensitive issue,” adding that Vladimir Putin discussed this matter in a very delicate manner, not putting Cyprus in an uncomfortable position before its EU partners. Despite the permission to enter Cyprus port for Russian ships, the sides also agreed that Moscow will restructure its €2.5 billion bailout loan it gave Nicosia in 2011. In return for being granted permission for Russian navy ships to stop off in Cypriot ports, Moscow has agreed to restructure its €2.5 billion (£1.8 billion) bailout loan it gave Cyprus in 2011. Russia isn’t only country to have military ties with Cyprus as the Mediterranean island state also planning to host British military bases. The cool down in relations with EU and the US saw Moscow working to maintain good relations with its long-time time European partners, including Greece, Hungary and Cyprus. Anastasiades spoke out against the implementation of further European sanctions against Russia as “they impact other countries [and] members of the EU, which include my motherland."